Evaluation expertise was required to support evaluation and survey design, conduct analysis, etc. Needed to gather data year-round for this on-going programme to understand change over time and with different activities. Needed similar metrics to compare across programs and be able to view benchmarking analyses. Accumulated a backlog of paper-based surveys needing data processing, analysis and reporting. Needed option with low staff time requirements. Results needed to be understandable by non-expert practitioners and available ‘on demand’ to inform decision-making of in-house staff and management. Research requirements were calibrated in consultation with a Qualia Analytics' Research Advisor and implemented using best available survey methods. An enrolment form allows collection of visitor demographics at events, even if the Feedback Survey is not completed. The online survey is accessible and easy to use for all visitors and family types, allowing maximum visitor participation. Survey questions are linked to automatic analysis in institutional dashboard. Institutional users can easily access real-time analytics. Data is owned by The National Gallery and always available for download. Users have continual access and sharing between institutional stakeholders. Survey system was designed to establish and support ongoing evaluation and research aims. An enrolment form collects contact details for respondents with their permission. The online feedback survey form accessible via the invitation email sent to respondents. Participants complete the survey by clicking on access link in the email, responding to the survey, and submitting their responses. 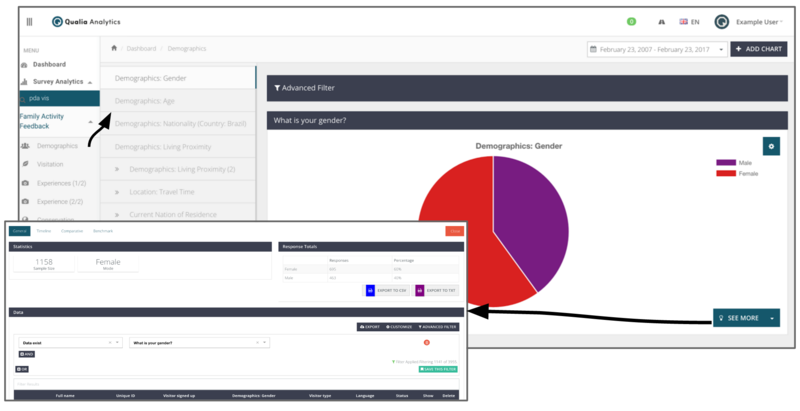 Automatic analysis is conducted in real-time, and includes graphs and charts with descriptive statistics and comparisons. 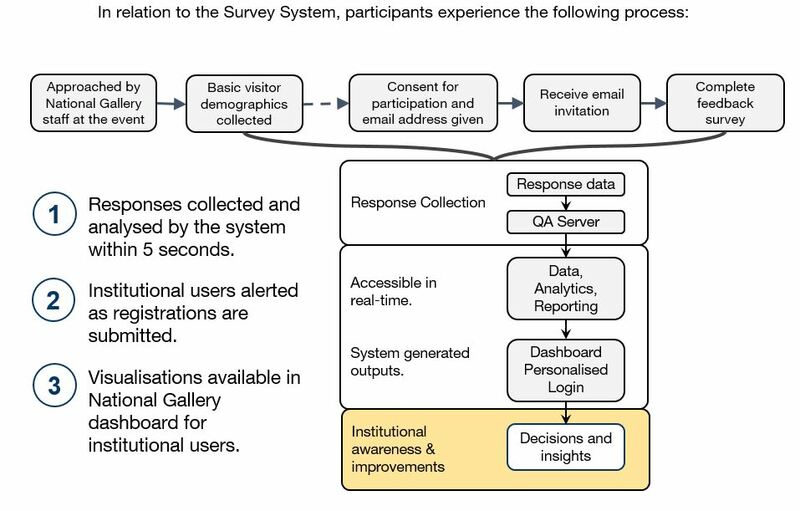 National Gallery users can always access individual and aggregate response data via the survey system dashboard. Data is always available for download and owned by the National Gallery. Enrolment survey is designed to be completed by National Gallery staff, by simply following the on-screen instructions. After collecting basic information, staff approach potential respondents to ask for consent and email address. Instructions for staff include suggested phrases for talking to visitors. Staff use tablets with the Qualia Analytics app for offline data collection. This is available to all institutions with an active Qualia Analytics survey system. Staff members simply select the correct responses. Respondents are greeted with an overview of survey. Respondents are reassured about privacy of responses. Respondents are informed that they will be automatically entered into prize draw. 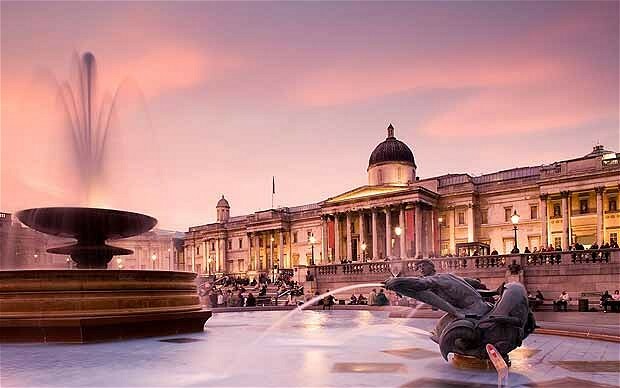 The survey starts by asking respondents about experiences and opinions on The National Gallery and the event that they attended. Likert scale questions automatically adjust on smaller screens to become more user-friendly. Respondents are asked further demographic questions. These are more in-depth than information collected with the Enrolment Form. Clear explanation of involvement in future evaluation or feedback schemes. Ensures respondents have their say on future contact in an explicit manner. Dashboard access is provided institutional users provided on request. 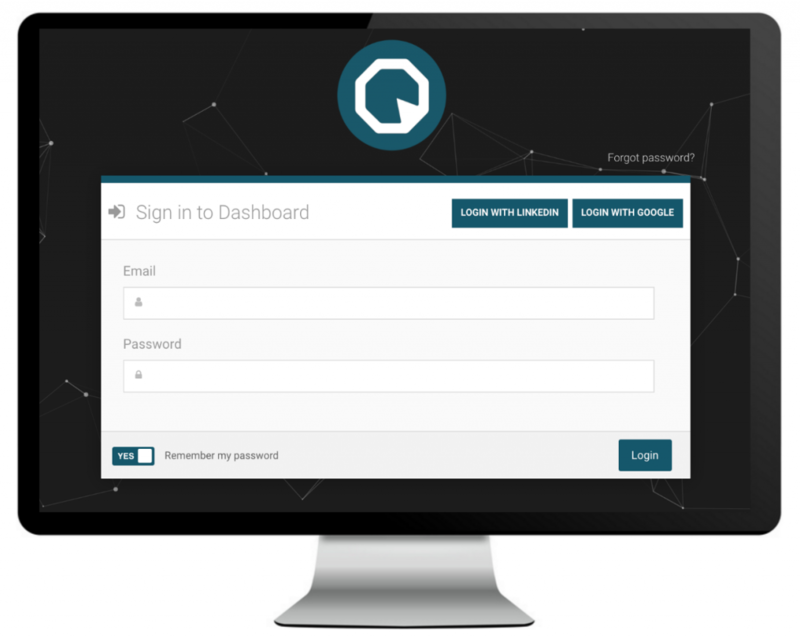 Access to institutional users provided on request. Login access e-mailed directly to users. Survey response data available immediately after submission through charts, graphs and tables. Information in tables can be viewed by clicking ‘See details’. Analytics are preset in initial setup based on needs of the study. These can be easily adjusted by Qualia Analytics staff upon request. Respondents can leave surveys and come back later. Internet can be unreliable. Collect data offline, then sync later. Compare results at all levels: respondents, programmes, etc. What do you need to know about your programs?